Also because of the rare and close connection often we look back and smile at our childhood and ponder how we have grown up and are where we are. With that said – even now living on the other side of Canada, when I see them it is like we just saw one another yesterday. Truly the definition of unconditional love. Since my beautiful nephew, Hunter was born almost 2 years ago, I try to visit home more often. Since having Hunter in my life, I realize they are the best illustration of life’s most simple, yet most overlooked principles. The simplest of their actions can reveal so much about our own lives. The fact that they are freely unaware, yet totally in the moment is intriguing. So is it possible that their innocence and zest for life gives them a perspective that we jaded adults may have lost? Children always want to be bold, explore and try new things. They don’t think of the consequences and stop themselves. They simply go for it and if they injure themselves, they often learn from that mistake. By being fearless they allow themselves the ability to grow. As adults we often hold back from doing things because of fear! We stop ourselves from taking chances and seeing what happens. Often when you look at the people that step outside of the boundaries and take risks – they are often the ones that are successful. Children enjoy being themselves and spread happiness to the people around them. They know how to enjoy life – period. They laugh often, goof around and don’t worry what others might think or say about them. They are just who they are with no filtration. In the daily rush of life, we forget to be ourselves. Learn that even in moments that seem awful – like your child dumping cheerios all over the kitchen, there are some things in life we just can’t anticipate. Even with a great deal of planning, it’s very possible that life will throw us a curve ball. We need to greet life’s curve balls with a sense of good humor and proactive fascination. Kids are impulsive – they have no barriers. They are honest and say what they think – they don’t hold back. So why are we depriving ourselves of the opportunity to express? It is better to be yourself, than try to pretend, just to be accepted by other people. I have often question what life would be like if there was less ego involved and more honesty. I believe that we should be able to speak our mind, courteously – as long as whom we are talking to doesn’t allow their ego to step in. This is how we can grow as individuals. So… Just be yourself and see what happens! I love the enthusiasm children have! They always have so much excitement when approaching anything. If we are hopeful, we will automatically be optimistic. Aside from a child’s mental enthusiasm – they are always on the go physically! Unlike the sedentary lifestyle we tend to adopt. Children are always up to something. As we should be too – in order to stay healthy longer. Children are born with a pure heart that gives naturally. When they give, it’s selflessly – they give with no expectation in return. As adults we should practice giving selflessly, or if we must have something in return – allow it to simply be a smile or the love we feel from it. Even for a positive gain, it’s better than to not give at all. Adding to giving selflessly – children often express love the same, with no expectations. This is the kind of love we should all seek and attain to give. One thing I have learned since including yoga into my life is happiness comes from within. There is no better example of this than with children. They are almost always happy, no matter what. They are always smiling or laughing and in return it makes us smile and laugh. So if we smile others smile, if we laugh often others will laugh as well. Being happy is the best thing you can gift yourself – and well others too! Children live in the present moment, free of thoughts of what they “should” be doing otherwise. They beautifully lose themselves in whatever it is they are doing, with their senses fully engaged. If you were to spend enough time alone and in silence, you would realize how much your mind is cluttered with thoughts. With its worries, to-do lists, anticipations, self-judgments, doubts and more. Most of these thoughts are unnecessary distractions trying to pull us away from the present moment and what really matters. A child’s mind does not have the clutter that adults have. There is not this inner battle of mental noise. This is why children can appear so quietly consumed and content in their activities. They know that what they are doing right here and now is more than enough. It is this awareness, this feeling, that we long to sense again. 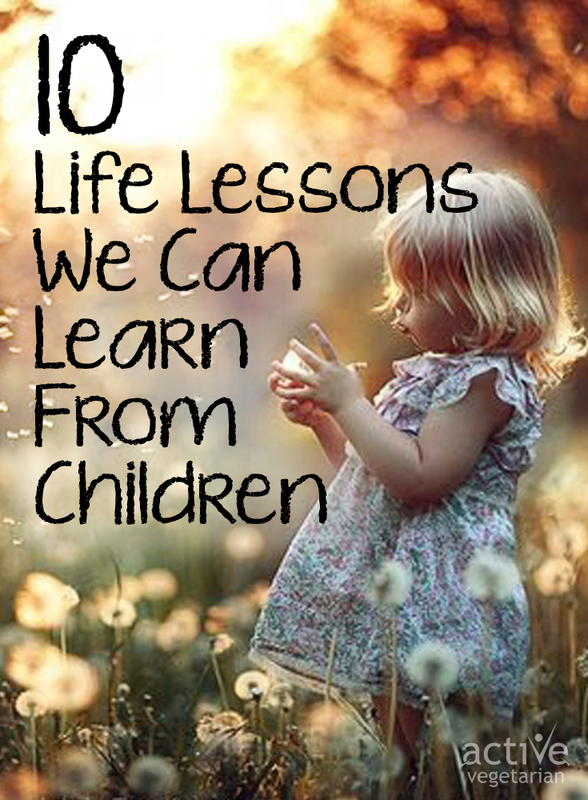 I hope you found these positive, inspirational thoughts and life lessons from kids useful. Feel free to share your thoughts in the comment’s section below.